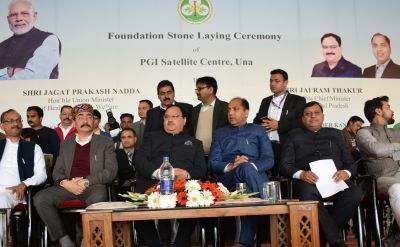 Una: Chief Minister Jai Ram Thakur and Union Health Minister J.P. Nadda today laid foundation stone of PGI satellite Centre at Malahat in Una district to be completed by at a cost of Rs. 480 crore. The Centre would be ready in next about 40 months. The Chief Minister said that PGI satellite Centre would ensure world class health care facilities to the people of the State which would have 300 bed capacity and specialised healthcare facilities at par with the PGI, Chandigarh. Jai Ram Thakur assured all possible help for time bound completion of PGI satellite Centre. 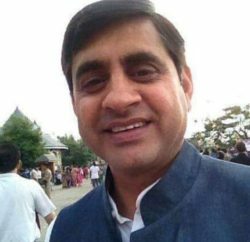 Jai Ram Thakur said the Union Government has launched Ayushmann Bharat Yojna for the people of the country for providing insurance cover of Rs. 5 lakh so as to ensure that the poor patients were not deprived of specialised health care facilities due to want of money. The State Government has also launched Him Care scheme to provide insurance cover to those families who have been left out from Ayushmann Bharat Yojna. 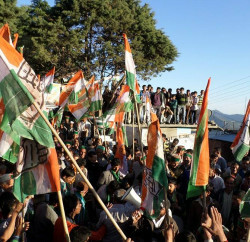 The beneficiaries have to contribute Rs. 1000 per annum to avail Rs. 5 lakh insurance benefit. Union Health Minister Jagat Prakash Nadda said the Union Government has ensured to extend benefit to the state by ensuring developmental projects worth crores for the State. He said that with the opening of the Centre, now the people of the State would not have to go to PGI for getting specialised healthcare facilities. Nadda said that the Rs. 1352 crore AIIMS was coming up in Bilaspur district which would be completed within the next two years. He said that hundreds crore of Rupees have been provided for different medical colleges of the State to ensure specialised health services to the people of the State. 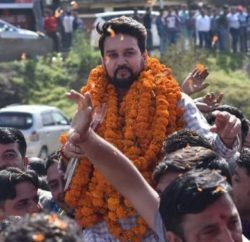 Member of Parliament Anurag Thakur said the PGI satellite Centre of PGI would prove a boon to the people of the region in getting world class health care facilities nearer to their homes. Director PGI Chandigarh Dr. Jagat Ram welcomed the Chief Minister and other dignitaries present on the occasion. He said that the Centre would have all the facilities at par with the PGI Chandigarh.